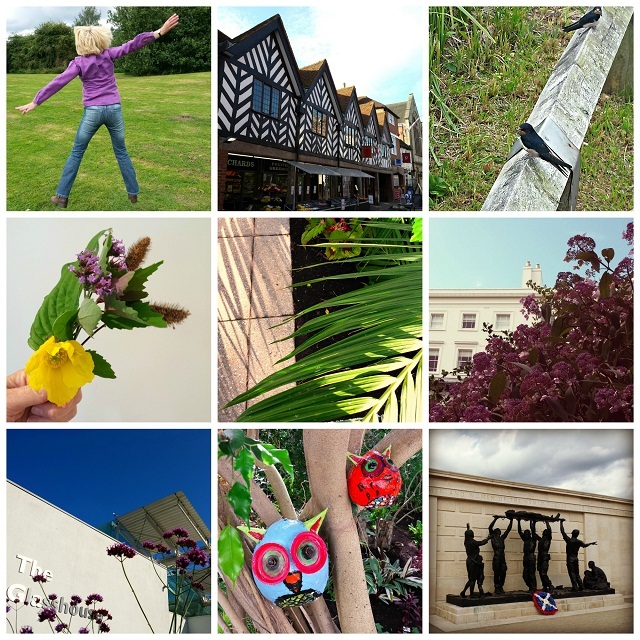 Here's my third collage of weekly photos taken as part of The August Break 2014 challenge. I've taken all of these pictures on my phone and I'm really pleased that I've kept going with this project as I think it makes a great visual record of the summer and what we've done. We haven't had a break away this summer, although hubs has had 2 separate weeks off work, so these photos are kind of like my alternative holiday snaps. Exploring our local area, using our National Trust membership and small treats like lunch out have meant that we've had a good break from routine and chores. Now that we're living a less hectic life 'Getting Away From It All' is not as important to us. We will have holidays in the future but for this year we've been content with having a few days out and the knowledge that our finances are under reasonable control. Being content with the here and now and gradually working towards simplifying our lives makes me happy most days. I do have my off days but I know that the simpler my life becomes and the less I succumb to envy the happier my general state of mind is. Here are the prompts for this week's photos (in correct order this time) with a sneaky extra one or three! ♥ Jump. Great exercise this one! My version of a star jump. ♥ Black and white. Local shops which I don't always appreciate the beauty of. ♥ Peaceful. These 2 birds were very much at peace with each other and very tame too. ♥ (Garden) treasure. I picked this posy from our garden for our kitchen table. It's still looking good - I just keep adding a new poppy as each one finishes. ♥ Shadow. This photo of a tropical plant was taken inside The Glasshouse, Jephson Gardens, in Leamington Spa, Warwickshire. The gardens here are well worth a visit and the town has lots of great independent shops and eating places. ♥ Handsome Regency houses seen from the park. ♥ The outside of The Glasshouse. Californian almost. ♥ Adornment. Cute owls adorning the tropical plants inside the temperate Glasshouse. ♥ Memory. This statue is part of The Armed Forces Memorial at The National Memorial Arboretum, Staffordshire. It depicts a serviceman, his comrades and his family looking on. So, so poignant. Thank you so much for reading, commenting and following here this week. Your comments on my 40 piece minimalist wardrobe made me very happy. I do understand the difficulty in letting go of clothes (it's taken me almost 3 years to get to this point) but I would urge anyone considering a smaller wardrobe to give it a try. You really do get used to less clothes very quickly and value and enjoy the ones you have kept as well as the time saved in getting dressed with less items. Go on give it a go! ... so elegant, I agree! Are those swallows in the third picture?? They certainly do seem very tame and relaxed, great pictures! Lovely photos Claire - and I like to think the first one is you jumping for joy because your life and wardrobe are so wonderfully simplified!